You can jump to . . . . 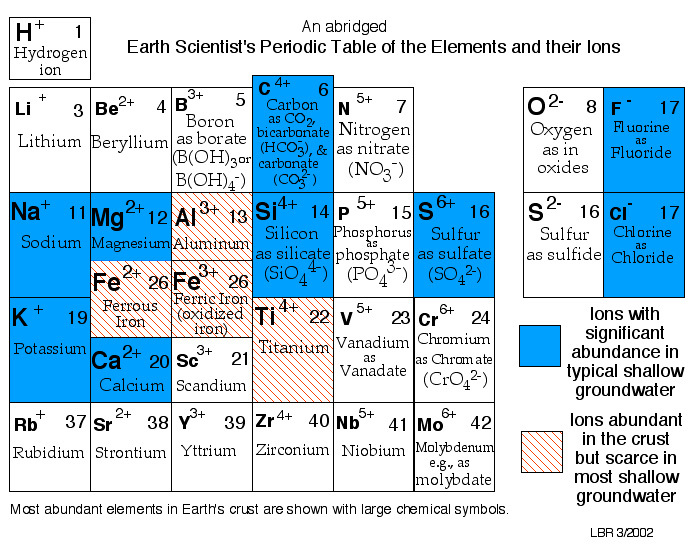 The Earth Scientist's Periodic Table of the Elements and Their Ions is a new periodic table designed to contextualize trends in geochemistry, mineralogy, aqueous chemistry, and other natural sciences. It is fundamentally different from the conventional periodic table in organizing entities by charge and consequently in showing many elements multiple times because of the multiple charges or valence states taken by those elements. These differences make the new table much more effective in showing trends and patterns in geochemistry, mineralogy, aqueous chemistry, and other natural sciences. Version 4.6 of this table was published in September 2003 as an article in the Geological Society of America's journal Geology and subsequently featured in several news outlets. Version 4.7 was published in May 2004 in the Geological Society of America's Map and Chart Series. Version 4.8 was released in May 2007 and is now available here (See "Availability", below). 610 K pdf file in 36"-wide format. 3600x1664 pixels 3.5 MB jpeg file. 9834x4546 pixels 13 MB jpeg file. reprint of the 2003 paper that accompanied the original table. The Geological Society of America's GSA Bookstore has Version 4.8d of the table for sale on paper as Item MCH 092REV of GSA's Map and Chart Series. It's available through their GSA Bookstore website. 3000x1500 pixels 1.5 MB jpeg file of the Chinese-language table. 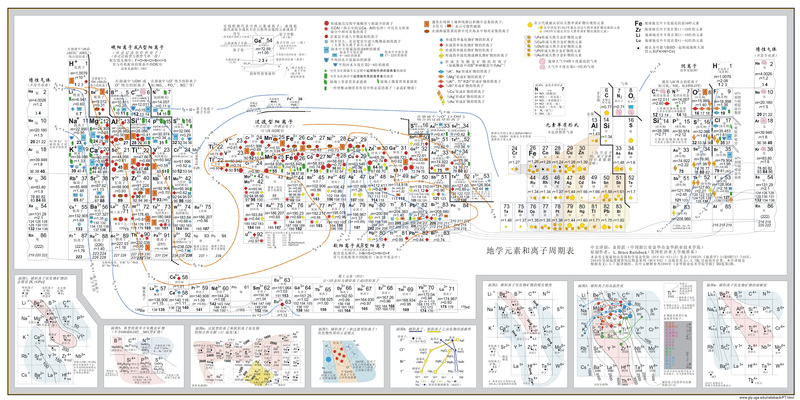 5000x2500 pixels 3.3 MB jpeg file of the Chinese-language table. 10,000x5000 pixels 8.4 MB jpeg file of the Chinese-language table. 12 MB pdf of the Chinese-language table. 548 K pdf of Chiyue Jin's paper (in Chinese with English abstract). The table is also available in Catalan, as translated by Miguel Vilà of the Institut Catrogràfic I Geològic de Catalunya. The table is also available in Spanish, as translated by Professor Juan Pablo Bernal of the Departamento de Geoquímica of the Instituto de Geologia of the Universidad Nacional Autónoma de México (UNAM). The paper and the table were published in Revista Mexicana de Ciencias Geologicas, volumen 25, numero 2. The table is also available in Portuguese, as translated by Professor Raquel Franco de Souza of the Departamento de Geologia of the Universidade Federal do Rio Grande do Norte in Natal, Brazil. Her paper and the table were published in Terrae Didatica Volume 8, Number 2, pp. 51-57 in 2012. 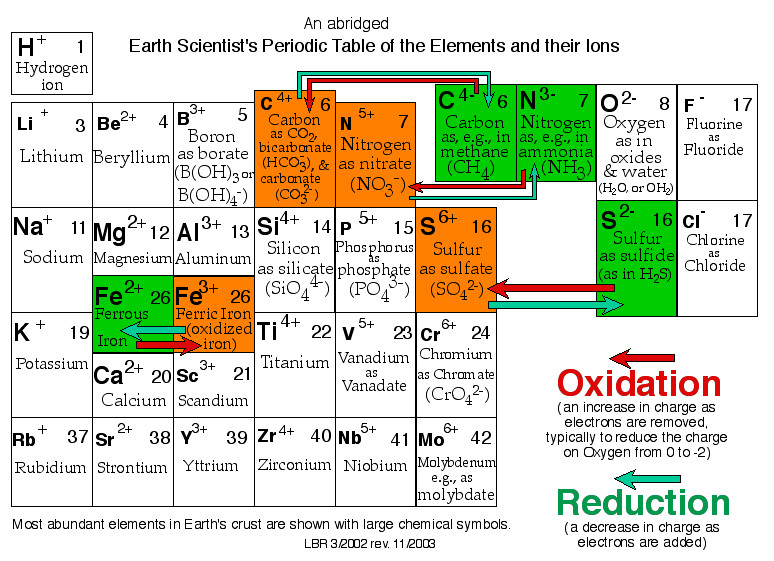 Raisback has a fifty-minute talk about The Earth Scientist's Periodic Table of the Elements and Their Ions. You can download the 26 MB Powerpoint presentation for that talk; it will have all his slides, and the comment box will have his monologue regarding each slide. If you haven't had luck with the on-line presentation or version with pop-ups just above . . . . The best way to start with the table is to go to the legend at top center. It shows that there are many small colored symbols for natural occurrences of ions. Then go to the left side of the table, to the block labeled "Hard or Type A Cations". In this block, you should see that those symbols fall in blue-and-green, red-and-brown, and blue-and-green swaths. You're seeing the main strength of this new table: natural occurrences of ions fall in predictable patterns across this table, whereas the conventional table doesn't make much sense of natural occurrences. As you look at this left-hand block of "Hard or Type A Cations", you'll notice one of the table's two major differences from previous tables: the ions are rowed by charge and so go, for example, from Na1+ to Mg2+ to Al3+ to Si4+ to P5+ to S6+. That new arrangement is what lets the swaths of color emerge. If you now go to the right, to "intermediate cations" and onward over to the anions, you'll see the table's second and even more fundamental change from conventional tables: some elements appear multiple times. That's because they take on multiple charges in nature, and behave very differently in those different conditions. For example, sulfur appears as S6+ (sulfate), S4+ (sulfite), S0 (elemental sulfur), and S2- (sulfide). Sulfur exists in all those forms in nature, generally from earth-surface oxidizing conditions on the left (as S6+ in sulfate) to deeper reducing conditions on the right (as S2- in sulfide). If you now look at the entire table, or at least the left and middle (the blocks hard and intermediate cations), you'll see the colored symbols fall in swaths across the table. Those swaths follow some colored curving lines. Those curving lines are contours, just like the contours on a topographic map, but these contours are of z/r, or of ionic charge divided by ionic radius. For example, Ca2+ in the hard cations has a charge of +2 and a radius of 1.0 angstroms, so its z/r is 2. That's why the blue line for z/r = 2 goes through the center of the box for Ca2+. The reason for pointing out these lines is that they coincide with the swaths of symbols very well, suggesting that the ratio of charge to radius, or z/r, is an important parameter in chemical behavior. z/r is essentially a measure of how highly focused charge is in an ion - the larger the ratio, the more intense the charge. If z/r is small, a cation has weakly focused charge and so only weakly bonds to O2-, our most abundant anion. Such a cation is easily dissolved from minerals and goes into solution - hence all the blue symbols for dissolved substances at the left of the hard cations. Higher ionic potential allows more effective bonding with oxygen to allow formation of oxide minerals and retention in soils and solids - hence the red and brown symbols down the middle of the hard cations. Very high ionic potential, however, means that cations begin to repel each other in solids (despite bonding very strongly to O2-), so that such ions are more soluble - hence the blue symbols at the right of the hard cations. Inset 7 at the bottom of the table shows all this schematically. The other insets at the bottom of the table contain some graphs to show that various mineral properties follow that same patterns as the overall trends in the main part of the table. There's a lot more to see in the new table, but hopefully this helps get you started. 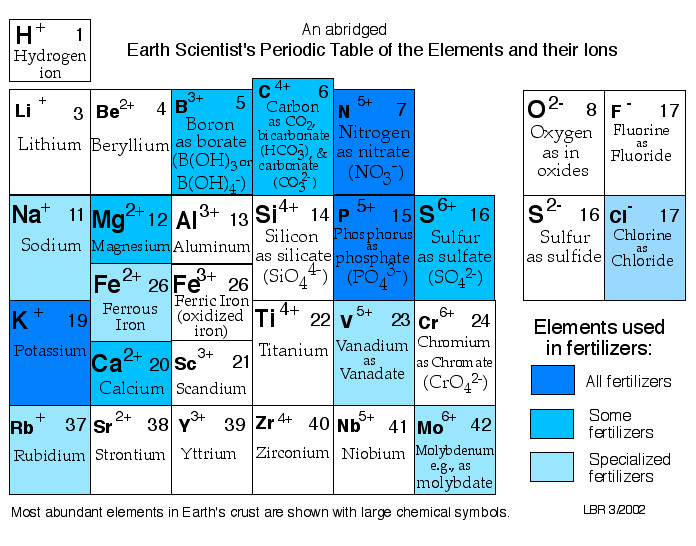 There are also some accompanying figures to illustrate the usefulness and application of the Earth Scientist's Periodic Table of the Elements and Their Ions. Some of these (3, 6, and 7) have become insets in the Table; the others have not. Accompanying Figure 1 shows how speciation in aqueous solution varies across an important part of the periodic table. Accompanying Figure 2 shows which elements make oxide minerals and which only make oxo-complexes in solution and/or gaseous oxides. Accompanying Figure 3 shows patterns in the chemistry of simple oxysalt minerals. Accompanying Figure 4 shows patterns in the chemistry of OH-- and O2--bearing oxysalt minerals. Accompanying Figure 6 shows variation in the solubility of oxides of hard cations. Accompanying Figure 7 shows variation in the melting temperature of oxides of hard cations. Accompanying Figure 9 categorizes cations across an important part of the periodic table according to their behavior in the crystallization of magmas. Accompanying Figure 10 shows that Si4+ is scarce in early-forming igneous phases and only becomes abundant in late-forming igneous phases. It's part of an argument developed in Accompanying Figure 9. A pdf file of a part of the table showing colors of minerals - a useful document for mineralogy students. 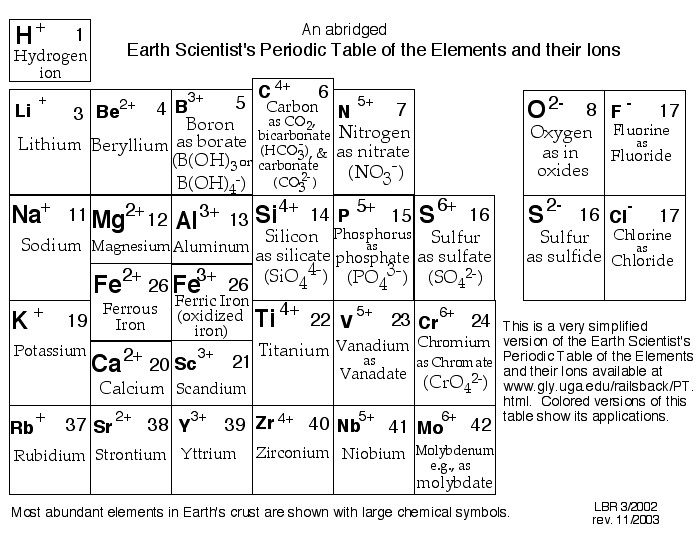 If the periodic table discussed above is too complex for the uses you have in mind, here are links to some very simple and abbreviated versions that Railsback uses in his physical geology class for non-majors. 1. In the boxes for Si4- and P3-, the table says that "The only known natural occurrences of phosphides and silicides are in meteorites and cosmic dust." There are in fact natural occurring terrestrial phosphides and silicides. Phosphides have been reported in iron masses from Disko Island, Greenland (Pedersen, A K. & Ronsbo, J . (1987) Oxygen deficient Ti oxides (natural magneli phases) from mudstone xenoliths with native iron from Disko, central West Greenland. Contributions to Mineralogy and Petrology 96, 35-46). Iron phosphide and various iron silicides, along with native silicon, have been found in a terrestrial fulgurite (lightning strike melt) (Essene, E.J. & Fisher, D.C. (1986) Lightning strike fusion: extreme reduction and metal-silicate liquid immiscibility.Science 234, 189-193). Essene and Fisher also list many other reported terrestrial occurrences of silicides. 2. Inset 5 includes names for nitrate minerals. The currently accepted names for NaNO3 and KNO3 are nitratine and niter, respectively, rather than soda niter and nitre. 3. Inset 5 implies that niter and natratine (KNO3 and NaNO3) are the only simple anhydrous nitrate minerals, so that such minerals only form with 1+ cations. There is in fact also a Ba(NO3)2 mineral, nitrobarite. That changes the wording of the generalization, but not its spirit, in that the revised wording would be that nitrates "only form with 1+ cations, and 2+ cations of very low ionic potential". Versions 4.6 and 4.7 have an error in Insets 2, 3, and 4, in that Th4+ is shown as Th5+. If you spot more problems, please send your comments to rlsbk@gly.uga.edu. 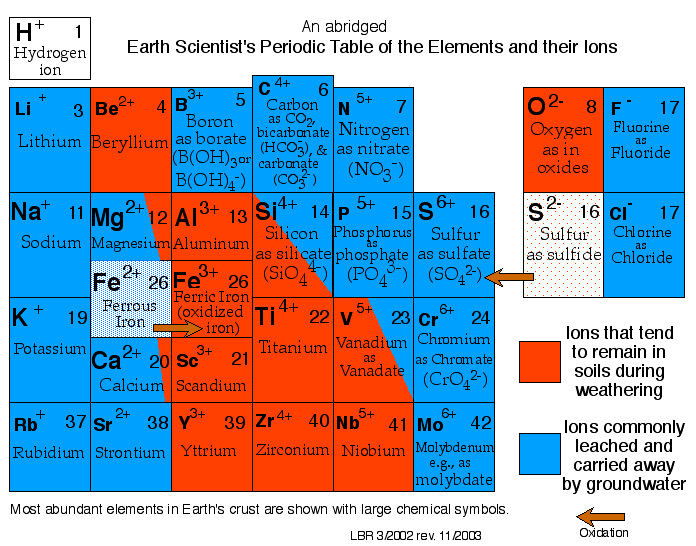 Subsequent to its publication in Geology, the Earth Scientist's Periodic Table of the Elements and Their Ions has been covered in . . . .
Geology.com for September 10, 2005. UGA's Research Magazine (vo. 34, no. 1, p. 44-45 summer 2005). Around the Arch (a UGA publication) v. 2, no. 3 p. 5 June 2004. Emily Lakdawalla's blog on the Planetary Society website, June 2012. Jesper Dramsch's The Way of the Geophysicist website, June 2012. 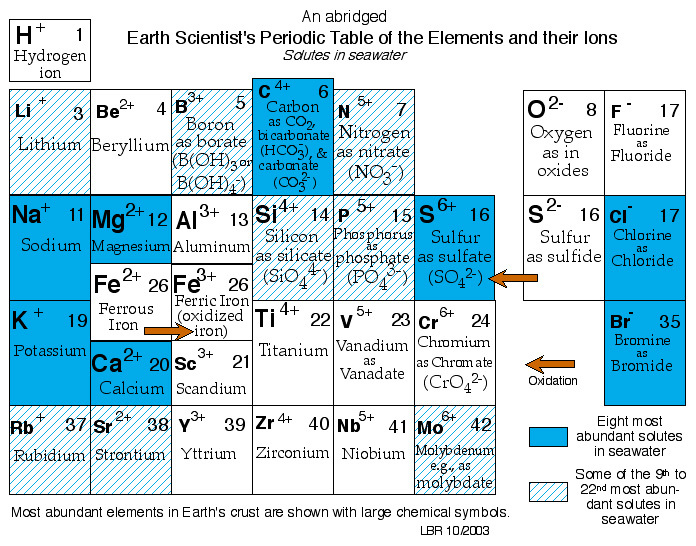 For anyone interested in translating the table into a language other than English, Bruce Railsback has prepared a version of the Earth Scientist's Periodic Table of the Elements and Their Ions from which all English has been removed. Railsback would provide the blank template on the condition that the translator would send back a finished translation that could be made available on this website so that it would be available globally. The translation would also be required to contain a statement that the table had been published in English in the Geological Society of America's journal Geology and in its Map and Chart series, and that the English-language version is available from GSA. Contact Railsback for details and to get the template. 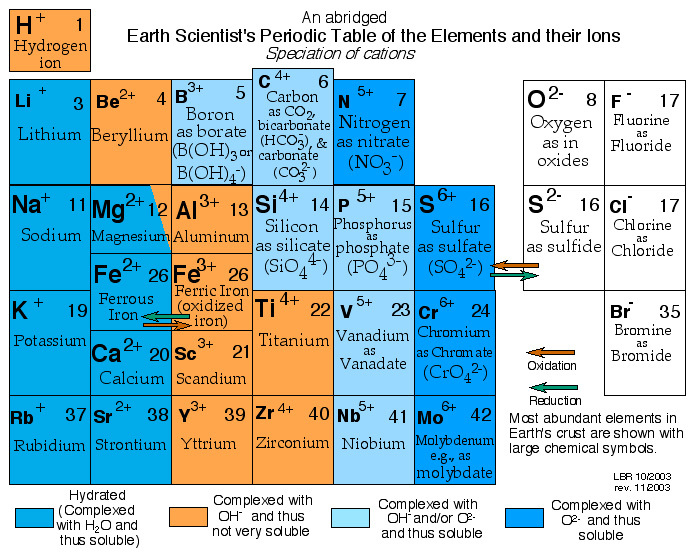 There's a page of questions and answers about the Earth Scientist's Periodic Table of the Elements and Their Ions. There's also a page on early analogs of the Earth Scientist's Periodic Table of the Elements and Their Ions. Among the many people whose comments and suggestions improved the new table in its early stages are the faculty of the Department of Geology of the University of Georgia, especially Drs. Michael F. Roden and Paul A. Schroeder, and Mr. Drew Mirante of the same department and Dr. Celeste M. Condit of the same university. GSA's reviewers provided many insightful and useful comments that improved the table and its accompanying manuscript. Geology Editor Ben A. van der Pluijm, Managing Editor Anika Burkard, and Copy Editor Mary C. Eberle of Wordrite all facilitated and enhanced the transition of the table to its published form. The National Science Foundation's Directorate for Undergraduate Education provided Grant DUE 02-03115 to support publication of the table as a large-format document in Geology. Any opinions, findings, and conclusions or recommendations expressed in this material are those of the author and do not necessarily reflect the views of the National Science Foundation. GSA's publication division greatly enhanced dissemination of the table by promoting it in media releases to news outlets outside GSA. Alexandra Goho of Science News, Elizabeth Nadin of Earthscope, Amy Perry of Today's Science on File, Dr. Stephan Reebs of the Departement of Biology of the University of Moncton and writer for Natural History, Eric Levin of Discover, and many others wrote useful and occasionally flattering reports about the table. Subsequent to publication of the table in Geology, Dr. Eric Essene of the University of Michigan, Dr. Joel Leventhal of the U.S. Geological Survey, Dr. Lawrence Grossman of the University of Chicago, and Dr. Johan Ingri of the Luleå University of Technology in Sweden provided insightful comments that improved the table in the transition from Version 4.6 to 4.7. Dr. Mark R. Leach of the Division of Chemistry of the University of Salford (UK) has also added insights about the hard-soft or A vs. B division of cations, and you're encouraged to visit his recent analysis of the HSAB principle and his his chemical thesaurus. Reproduction of the table in GSA Maps and Chart Series was facilitated and overseen by GSA's editor of the Map and Cart Series, Dr. J. Douglas Walker of the University of Kansas, and the manuscript was improved by his comments and those of an anonymous reviewer. Revision regarding bacterial nutrients was aided by the helpful comments of Drs. Anne O. Summers and Samantha Joy of the University of Georgia. All of the above are thanked for their help. The length of this list illustrates the extent to which no work in the sciences, even a single-authored document, is the work of just one person. Railsback has a roughly hour-long presentation to introduce the periodic table to academic audiences. It includes several diagrams in addition to the table itself. If you're interested in having him come to your institution to bore your students and/or colleagues with that talk, email him at rlsbk@gly.uga.edu. He'll bring a wall-size paper copy for the talk and leave that copy for your institution's further use. He also has a related talk titled "A Systematic Explanation of Systematic Mineralogy" that he can give; you can see the abstract and key figures. Persons who find the visual presentation of geochemical concepts useful may also be interested in Railsback's Some Fundamentals of Mineralogy and Geochemistry. If you bookmark this periodic table, you should bookmark this page rather than a jpeg or pdf file. That is because files for subsequent versions of the table will have different URLs than that of the present version. The URL of this page should not change. Back to Railsback's main web page.